Woman in Robe à la Turque. In the Orient, where one enjoys a sweet climate, pure air, a cloudless sky, men wear long garments, which have fullness and nobility. An almost continual winter, a bitter and dry cold, permit the same practice in some Inhabitants of the North, like the Poles and the Russians, who once displayed an oriental luxury. 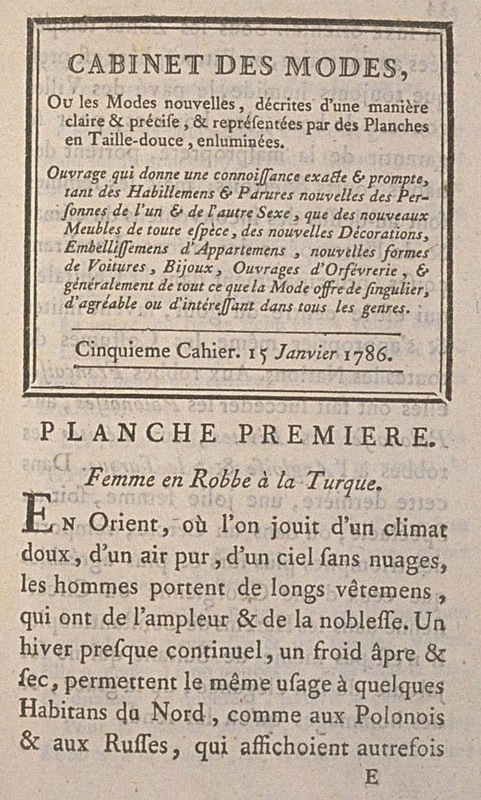 In the temperate Zones to the contrary, where the atmosphere is nearly always humid, the City cobbles covered with mud, the men, to protect them from impropriety, wear short and narrow coats; but women are above the inconveniences of the climate and the intemperacy of the seasons. 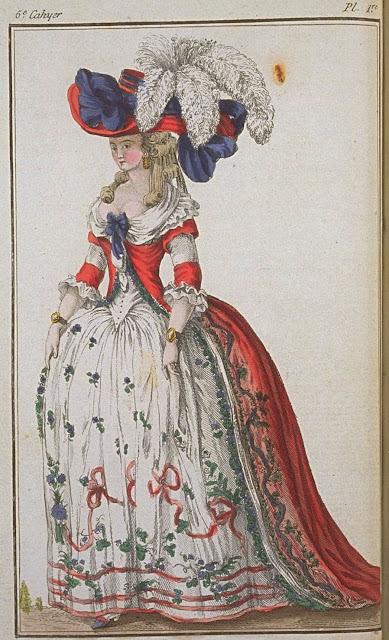 Frenchwomen, principally in the capital, which is the center of taste, know how to imitate and appropriate even the Costumes of all the Nations. 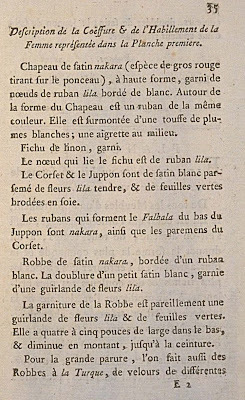 The robes Françaises have been succeeded by the Polonaises, the Polonaises by the Lévites, the Lévites by the robes à l'Anglaise and à la Turque. 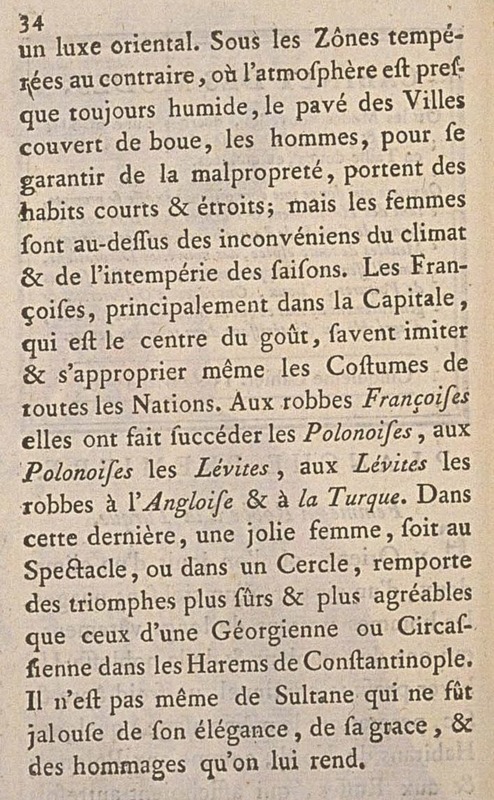 In this latter fashion a pretty woman, whether in a Show or in the Seats, wins triumphs surer and more agreeable than those of a Georgian or Circassian woman in the Harems of Constantinople. 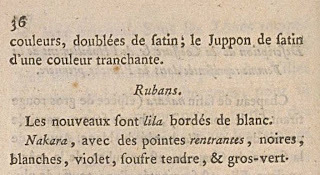 Even the Sultana was jealous of her elegance, her grace, and the homages that were made to her. 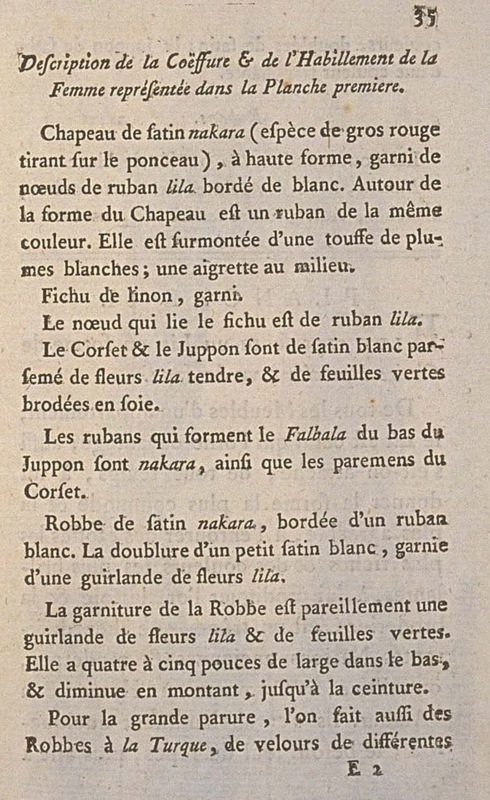 Description of the Coiffure and Dress of the Woman represented in the first Plate. Hat of nakara satin (a type of dark red verging on the poppy), with a high crown, trimmed with lilac ribbon bows edged with white. Around the crown of the Hat is a ribbon of the same color. It is surmounted by a tuft of white plumes; an aigrette in the middle. The bow which ties the kerchief is of lilac ribbon. The Corset and Petticoat are of white satin spotted with soft lilac flowers, and green leaves embroidered in silk. The ribbons which form the Flounce at the bottom of the Petticoat are nakara, as are the cuffs on the Corset. Gown of nakara satin, edged with a white ribbon. The linen is a light white satin, trimmed with a garland of lilac flowers. The trimming of the Gown is, to match, a garland of lilac flowers and green leaves. It is four to five inches wide at the bottom, and diminishes while climbing, to the waist. 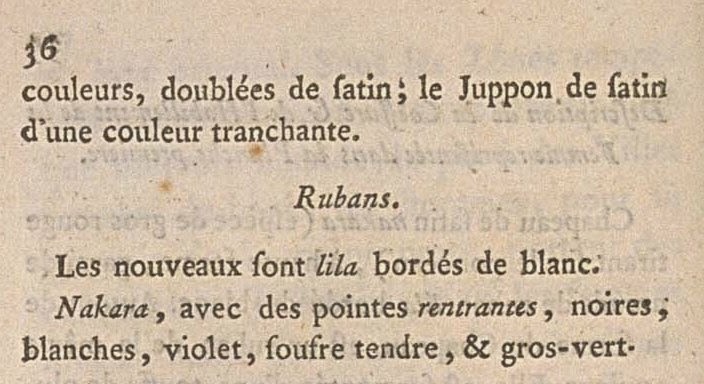 For the grande parure, Robes à la Turque are also made, of velvets of different colors, lined with satin; the petticoat of satin in a contrasting color. The new ones are lilac edged with white. Nakara, with retreating points, black, white, violet, soft sulfur, and dark green.